The end of the year is upon us and with it comes a slew of preparations to make the next one a little more doable. 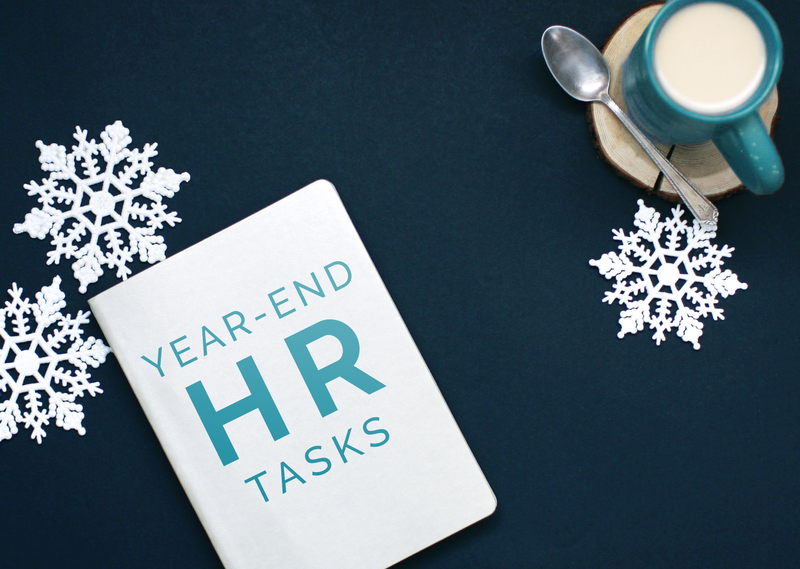 Small business owners in particular have a seemingly insurmountable amount of HR tasks to complete; we know you’re busy, so here’s an end-of-the-year checklist to ensure you meet all of your HR needs. Perhaps the most important task you’ll have to accomplish before everybody goes home for winter vacation is running the payroll gauntlet. This means you’ll be scrambling to order forms, verify employees’ statuses, and much more; fortunately, performing these responsibilities now will make your job significantly easier later. Review everybody’s salaries. If you need to adjust any for cost-of-living changes or competitive reasons, now is the time to do so. Verify employee statuses. Are your employees largely exempt or non-exempt? Are you working with a staff of FTEs or contractors? Order forms W-2 and 1099-MISC, as well as any other pertinent tax forms. Review all employee tax information. Any employees with new addresses, name changes, different tax brackets, and so on will need to have their W-4s updated accordingly. Schedule holiday bonuses and end-of-the-year pay raises. You should do this well ahead of the company deadline so employees have ample time to update their income information. Double-check your benefits. You’ll want to make sure your benefits packages are ACA-compliant, which entails calculating your number of full-time employees, running an affordability test on your existing packages, and so on. You shouldn’t have to deviate from these criteria too much, but keep in mind that your company’s needs may supersede the usual payroll checklist. Need additional payroll help? Check out our 8 FREE paycheck calculators. You’ll likely spend a fair bit of time sitting in your office waiting for your fellow employees to finish their jobs so you can continue doing yours. This downtime presents an opportunity for you to review your current policies and procedures for archaic or otherwise-outdated legislature; if you find anything that needs changing, updating it before the new year rolls around will afford plenty of time to implement the appropriate changes. You can also use this time to take a look at the employee handbook. Since you’ll probably be onboarding some new hires this upcoming year, make sure the information listed provides an accurate (flattering, even, if you’re up to it) representation of the company and its culture. If it’s out-of-date, you’ll want to bring it up to speed and distribute the updated copies before everybody heads out for the holidays. Finally, this is a good time to remind employees about their flex account balances. Split your employees’ files into subfolders. These subfolders will vary based on your company’s needs, but most filing systems will benefit from things like having the employees’ personal files and medical files separate from one another. Throw out any superfluous or otherwise irrelevant material. This includes spare forms from the previous years, expired receipts, and the like. Clear out detritus. Things like pencil shavings, unused staples, and writing utensils often work their way into your filing cabinet drawers. Consider cleaning up your computer’s desktop and filing systems as well. If everybody’s information is efficiently stored and easy to retrieve, you’ll notice a huge upswing in productivity and workflow when you return from your holiday. Asking your employees to accurately forecast for time off for the coming year can be a challenge, but it’s necessary for you to have as complete a calendar as possible. If your company runs on a first-come-first-serve basis, you’ll want to send out vacation time reminders and the relevant calendar slots in order to prepare for the inevitable sign-up melee. This whole process can be incredibly hectic, of course, so be ready to put out a fire or two on top of everything else you’re doing at this point. There are always a few odds and ends to contend with, and this year probably won’t be any different. After all the payroll, organizational, and logistical aspects of your job are complete, consider delving into assessments. Employee assessments are either a beloved or a dreaded part of your company’s culture—this year, shoot for the former. If it’s possible, try to arrange a one-to-one meeting between each employee and their respective department head. Have the employees set goals for the coming season; if they did so the previous year, have them review their former goals in respect to their performance. The end of the year is also a great time to set company goals for the following year. Take a quick look back at your year and assess what your company did right; doing so will both give you an idea of what to do (and what not to do) going forward and reinforce employee morale. Is staying on top of HR and employee paperwork a top priority for 2018? Ask about our HR Help Center for only $10 per month for support & guidance throughout the year. Finally, make sure someone cleans out the coffee pot before the lights go off for the holidays. Nobody wants to come back to a moldy carafe. The end of the year is, at best, an incredibly stressful time for any company’s HR department—why not let us ease your burden? For any questions about HR tasks or a free quote, call Abacus Payroll at (856) 667-6225 today!